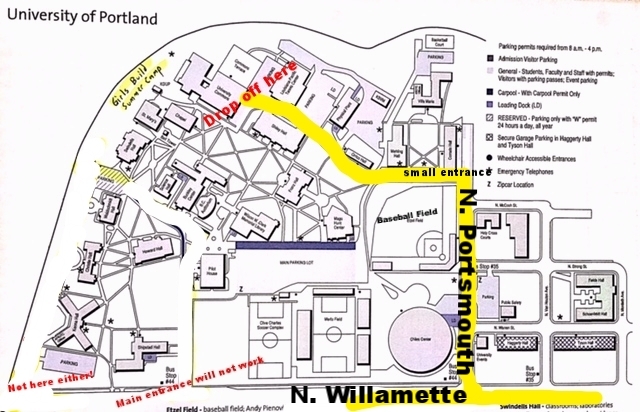 Please see map below for specific location on campus PLEASE NOTE: This is a different drop off location than camp! The simplest route is to enter via Portsmouth, and take the small entrance just after the baseball field. Campers will be dropped off in front of the cafeteria with a staff person, and you can loop around that parking lot in order to exit. Campers will be bused from University of Portland to World of Speed in Wilsonville. The bus is chartered by EcoShuttle, and a Girls Build chaperone will be present with them throughout the day. Pick up and drop off at the parking lot by the cafeteria, which is behind Shiley Hall and the tennis center (roughly). Look for Girls Build staff. You can park in that parking lot, or just pull up to the staff and sign in on the iPad. Girls Build will provide breakfast and lunch. Breakfast will be generously donated by Bon Appetite, and lunch will be provided by Girls Build. If your child has any dietary restrictions, please send along a lunch, as we will very likely be having pizza. Campers will be inside an air conditioned space essentially all day, including on the bus, so heat should not be a problelm. This day is included in your camper fees as part of a generous donation by the Marie Lamfrom foundation. No extra payment will be charged. All parents must fill out our release forms prior to automotive day. If you have signed releases for camp, you are all set. If you have not done so, please click here to complete and sign the forms. Campers will split into two groups, and spend half the time touring World of Speed and the other half doing automotive work in the auto shop.